Wrightspeed is a provider of hybrid powertrains that can be retrofitted to existing delivery trucks to create a Hybrid Electric Fleet Truck (HEFT) with an electric motor drive and a diesel generator to create much greater fuel savings than passenger cars ever could, regardless of fuel efficiency. The company is the brainchild of Ian Wright, a former employee of electric vehicle pioneer Tesla. 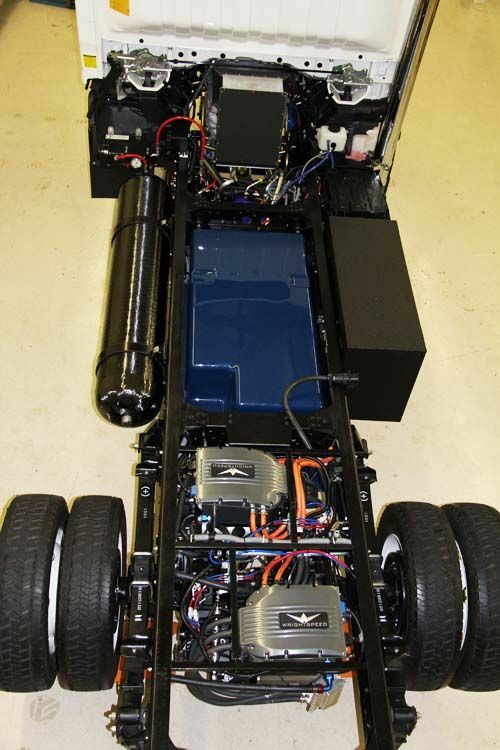 The system he has devised removes heavy engine, transmission and drive elements, replacing them with a lighter weight electric drive and generator system that can achieve up to four times the mileage of the current fleet truck. Not only that, it can be charged up overnight to further extend its savings. According to the system’s description the new system weighs less than the components it replaces since the system generates its own electricity with a diesel generator, the battery doesn’t have to be as big. Called The Route, the retrofit promises savings on fuel of up to 50 percent, while meeting the performance expectations of route drivers, without reducing the payload capacity of the vehicle. "Urban cars average 12 miles per hour and drive an average of 12 hours per week. That's 7,500 miles per year. If that car got 100 mpg, it would burn 75 gallons annually. If that car were to replace a 40 mpg hybrid, which would burn, under the same conditions, 188 gallons, the fuel savings would be 113 gallons per year," states a company report. "However, the Route can get trucks 44 MPG (cost equivalent) at an average of 30,000 miles per year at, that's 700 gallons. When the Route replaces an 8 MPG conventional powertrain that burns 3,750 gallons annually, the fuel savings is 3,050 gallons. That's 27 times more fuel saved." It would seem the HEFT has the potential for hefty fuel savings in the segment of vehicles burning the most fuel in the land. It is the same approach used in the Chevy Volt and the Fisker Karma, simply because combustion engines create electricity much more efficiently than they do drive, getting more out of the energy dense fuel. Since replacing powertrains in fleet trucks is just part of doing business and the system requires no alteration of the body or chassis, it can be absorbed as part of the normal process of maintaining a fleet. As with any vehicle, the manner in which they are driven affects the resulting mileage, but The Route has an electric range of 40 miles on a charge, augmented by the onboard power supply. With over two million fleet trucks in the nation and savings of to 3,000 gallons each, that would add up to 6 billion gallons annually. That will make more difference than all 15 million passenger cars sold this year being hybrid or electric could. If the economics really make sense to the fleet managers, we think the time of the HEFT is now. We welcome its contribution to the greening of America. Incidently Wrightspeed also produces a package for builders of supercars that features a 250 hp electric motor individually controlling each wheel, thus creating 1,000 hp, with an Integrated motor, including 2-speed gear-reduction and a Power Electronics Module. It features Vehicle Dynamics Control, including stability, regenerative braking and traction control with a Native All Wheel Drive System, that has no differential or right-angle drive mechanisms. Sounds like a lot of fun! Very true But how could the greens kill the car if this succeeds? As you know, I cover a lot of commercial transportation and while I somewhat agree with this, I also disagree. The hybrid-electric option is great for SOME fleet trucks in specific scenarios. Those wit ha lot of start-stopping are actually seeing better benefit with hydraulic hybrid tech, which is simpler and cheaper to retrofit. Other vehicles that do heavier work at known distances, such as heavy tow trucks, though, can do well with a hybrid-electric option. Same with hybrid-electric plug-in options for work truck accessories (man lifts, winches, etc) that could cut idling and save a lot of fuel. It's great to see the number of things being explored for commercial vehicles. Hi there, I want to subscribe for this webpage to get most recent updates, therefore where can i do it please assist. Look on the right sidebar Harrison. The subscription is there. Thank you.